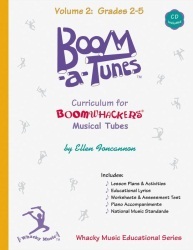 This curriculum by Ellen Foncannon is the most complete that has been developed for teaching music with Boomwhackers Musical Tubes. Volume 1 introduces treble music notation skills. Volume 2 continues treble reading through high G. Volume 3 introduces bass clef notes and grand staff reading. Volume 4 completes bass clef notes and grand staff reading. Volume 5 introduces triplets, seventh chords and Latin rhythms. Each book contains an instrumental CD and piano accompaniment. Each volume in this sequenced music education curriculum comes with lesson plans, activities, scores and MENC standards, BOOMWHACKERS Boom-A-Tunes Curriculum Volume 2 (Book/CD ) Boom-a-Tunes Curriculum. Volume 1 Uses C Major Diatonic Set. Introduces students to treble music notation skills. The educational lyrics teach the location of the notes on the staff and integrate singing and playing to involve the entire class. Kid-tested and teacher approved! 20 lessons. Grades K-3. Volume 2 Uses C Major Diatonic and Treble Extension Sets. Completes treble clef reading through high G. The 6/8 time signature is introduced with the memorable lyrics, "An eighth note gets one beat. Stomp your feet!" Actively involve all your students with music they can really get their hands on. 13 lessons. Grades 2-5. Volume 3 Uses C Major Diatonic, Treble Extension & Bass Diatonic Sets & Octavator Tube Caps. Introduces bass clef and grand staff reading. Covers time signatures, flats dynamics. 13 lessons. Grades 3-6. Volume 4 Uses all Boomwhackers Tube Sets (except Pentatonic) and Octavator Tube Caps. Completes bass clef notes and grand staff reading. Also, covers mixed meter, tempo markings, intervals, accents and accidentals. Involves the entire class in singing & playing. 11 Lessons. Grades 4-6. Volume 5 Uses all Boomwhackers Tube Sets (except Pentatonic) and Octavator Tube Caps. Covers triplets, seventh chords and Latin rhythms, mixed meter meter, major/minor/perfect intervals and temp markings. Includes and 3-part choral pieces. 10 Lessons. Grades 5-6.